William Bingham (1752-1804), Banker, Legislator. Founder and director of the Bank of North America, the first bank in the country (1781). Served in the Continental Congress (1786-89), and in the U.S. Senate (1795-1801). 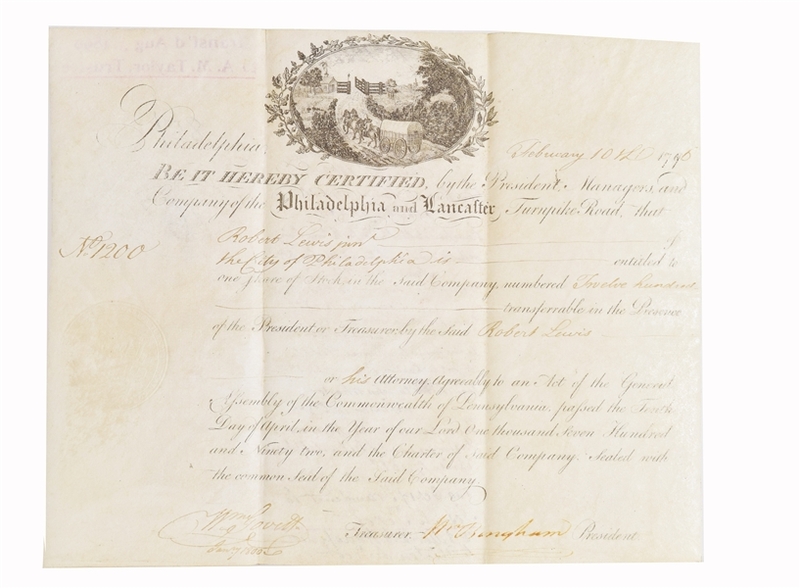 He signs this early Philadelphia and Lancaster Turnpike stock in 1796 as its first President. This is America's first turnpike! Printed on sheepskin and in Superb Condition. It has the most charming vignette of a covered wagon about to pass through a toll gate. These stocks were found in the 1970's in New York City. Becoming quite scarce in nice choice condition.